Providing a model to other megacities in the U.S. and the world, Chicago has officially set the goal of running entirely on clean energy by 2040. More than a hundred states, counties, and cities across the United States have pledged to transition to 100% renewable energy to cut carbon emissions and help curb climate change. The environmental organization Sierra Club lists them in alphabetical order. Six cities have already reached their goal — Aspen, Burlington, Georgetown, Greensburg, Rockport, and Kodiak Island — while some are making progress and others are just starting. Now, Sierra Club’s Ready for 100 Action Campaign club welcomes a notable newcomer. 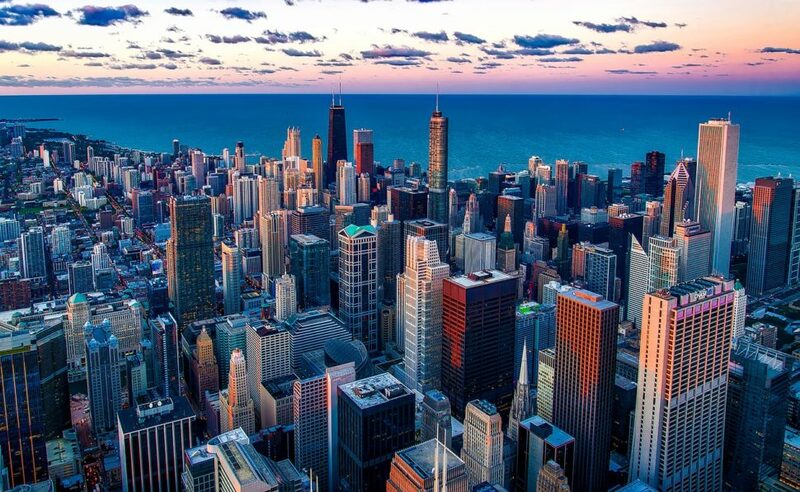 Chicago, IL, has become the largest U.S. city to commit to 100% renewable electricity. Members of the Chicago City Council have unanimously approved a resolution on energy policy to put the city on the path toward running on 100% renewable energy by 2040. On April 10, the resolution R2019-157, or Support for Implementation of Clean Energy Transition Plan, was passed into law and signed by Chicago Mayor Rahm Emanuel. The Windy City is turning away from fossil fuels with this plan that gets underway in December 2020. By 2035, all of Chicago’s buildings will be powered by clean and renewable electricity, which would be quite a feat for the country’s third-largest city that’s home to 2.7 million people. Before that, by 2025, all the 900-plus public buildings will go green. The plan sets 2040 as the due date for the Chicago Transit Authority (CTA) to have all-electric bus fleet. Currently, homes and businesses in the City of Chicago get power from Midwest plants, which rely on a mix of mostly coal (44%), nuclear energy (40%), and natural gas (12%), with renewable sources accounting for only 4%. The action and efforts at grassroot levels, like those deployed by the Sierra Club organization, along with political will are transforming Chicago’s power grid to become clean, affordable, reliable, and equitable. Last December, a coalition of organizations called the Ready For 100 Chicago Collective, focused on shepherding an equitable energy transition plan. Equitable here means the plan’s environmental and socio-economic impact should benefit all communities city-wide. Chicago is a member of the C40 Cities Climate Leadership Group, a network founded in 2005 that connects 94 global cities aiming to address climate change challenges. By committing to this bold climate action plan, Chicago could inspire other cities in the state of Illinois, nationwide, and in the world at large.